Fall has arrived and with it comes our September 2018 release! Hot on the heels of our SMS integration, we’re proud to announce the beta release of our Crelate Connector mobile app available on Android and iOS. Also included in this release are improvements to Activity Templates, better Activity Date Tracking, and to top it all off, a fresh new look! Read on to get more details about the changes. As always, we’re thankful for our wonderful community. If you would like to see what we’re working on next, be sure to check out our Product Roadmap. Your continued support and suggestions help us make Crelate every day. The newly released Crelate Connector app is equipped with a fully capable texting app available to customers with a Text Messaging by Crelate subscription. With the new app, You can send and receive messages from your candidates straight from your phone. 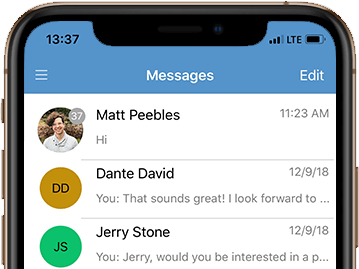 You’ll also have the ability to receive notifications, add contacts to your message list, and edit basic contact record information from your app. The app is fully synced with your Crelate account, so SMS actions are immediately reflected in your phone and vice versa. NEW Text Messaging by Crelate – Send and receive SMS messages that are tracked in your Crelate account. Add existing contacts from your Crelate account to the Crelate Connector contact list to start a conversation. Even if you’re not in the app, you’ll get notifications when new messages arrive! NEW View Contact Info – View basic information about contacts such as their email, name, and phone number. Clicking on the email or phone number will quickly open the corresponding app on your phone for a quick communication option. It’s been a long time coming, but we’ve taken a holistic look at our app and gave it a fresh paint job along with better positioning of useful information to keep your productivity at an all-time high! NEW Improved Date Tracking – Crelate works hard to surface the most relevant information so we’ve added better engagement tracking to inform you when you last spoke with someone at a glance. Find “Engagement” and “Reach Out” dates directly below the activities section. A Reach Out date is the last time that you attempted to contact that person. Alongside that is the Last Engagement date which is the last time a contact responded to your outreach or they initiated a conversation with you. These fields are fully searchable and you can add them as columns on the various Dashboards. For further fine-tuning you can customize which Activities count as Reach Out or Engagement activities in Settings > Activities. NEW Colors – Along with the new colorful navigation icons on the left, we’ve added a splash of color to our main record types to help key you in to what kind of record you’re looking at. Companies are light blue, Contacts are green, and Leads/Opportunities/Jobs/Employment Searches/Projects are orange. Last release we introduced Activity Templates to help simplify data entry and increase data quality. Now we’re releasing some updates to further increase the functionality and offer you more value from the forms you’re already using. 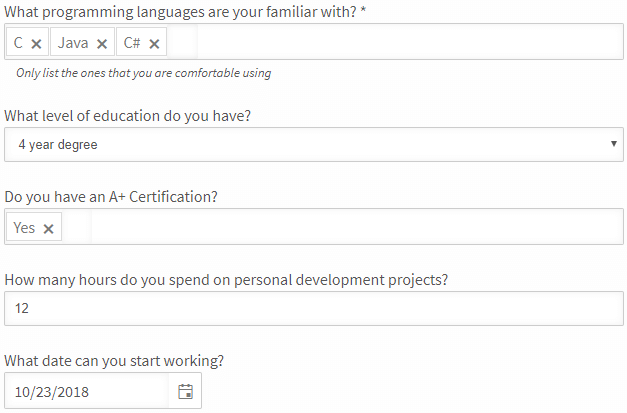 NEW Question Types – Ability to create number, currency, date, and custom pick-lists (with single choice and multiple choice options). NEW Default and Required Templates – There is now an option to set a default activity template for an activity type. What this means is whenever you create a new activity of a type that has a default template, that template will automatically render. If a default template is selected, you can choose to set it as required, meaning all required questions have to be completed. NEW View Activity Forms in Stream – After an activity is complete, you can view it directly in the stream by clicking on the “View More…” button at the bottom of the activity. NEW Search Responses – In search, you are now able to search for records by the responses to custom application form questions and activity form responses. ADDED – Activity Type Filter on Job Dashboard – The Activities column on the Job Dashboard can now be filtered to only show a specific set of activity icons. This filter is respected when the dashboard is exported. ADDED – Name Order Option on Job Dashboard – The name column for candidates can now be configured to be First Name Last Name instead of Last Name, First Name. This option is respected when the dashboard is exported. ADDED – View your Login Email in Your Profile – When viewing your Profile, you can now see the email address associated with your Crelate account. ADDED – Exchange Email Credential Support – We’ve added support for Exchange Email accounts as a beta feature. Although in beta, it does have the full feature set of our other email credential options. IMPROVED – Reports Improvements – Stacked bar and column charts charts now allow showing “time” as the bottom axis of these types of charts. Stacked bar and column charts also show a percentage for each segment when hovering over it with the mouse. Finally, in the configurations for most reports, you can now easily swap the two axes for charts. FIXED – Changing Fonts on Email Templates Removes Mail Merge Fields – We’ve fixed a pesky bug that removed mail merge fields when the text’s font changed. Feel free to format to your heart’s content! FIXED – # of Days Columns on Job Dashboard Export Correctly – # of Days columns on the Job Dashboard will now show as number of days when exported instead of showing a date. FIXED – User Name Changes Now Reflected in Emails – When using an email credential to send email through Crelate, your name will now appear as it does in your User Profile even after changing it. FIXED – Company Name Parsing Options Respected Everywhere – Your Company Name and Job Title Parsing Settings are now respected when parsing inbound emails from Beyond and when sending emails with vCards attached to Crelate. FIXED – Date on Agenda View of Calendar – The date on the agenda view of Calendars has been updated to display above the button. FIXED – Unblocking Contacts with Duplicates – Unblocking a contact and choosing the “Just Save It” option will now actually just save it! FIXED – Error When Using Email Template with Deleted User – Selecting an email template that contains a mail merge field pointing to a deleted user will no longer cause an error. FIXED – Document Selection Dialog Previews All Documents Now – The Document Selection Dialog was previously not displaying non-documents. Now images, activity forms, and application forms will render properly in the dialog allowing you to preview their contents. FIXED – Date Controls Work Properly With Different Date Formats – Date controls will now work properly for users that have selected “day/month” as their date format instead of the default “month/day”. FIXED – Records Created via the Public API Now Indexed for Search – Records that were created via the Public API were previously not being indexed for search. FIXED – Correct Stage Names on Homepage After Name Change – Changing the names of workflow stages will now be reflected properly on the Homepage when in the “All Candidates” view. FIXED – Activity Creation on Stage Change – When moving an opportunity to a new sales stage, if it is configured to create a “stage change” activity, it will now do so. FIXED – Import Views Now Selectable – Views that are created for records from a spreadsheet import will now work properly when selected from the View Picker. FIXED – Filter by Name on Employment Search Board – Filtering by name on the Employment Search Dashboard will now work properly.